Some movies have implied violence. A man holds a gun up to a door where on the other side of the door in an unsuspecting man not knowing the danger he's in. The trigger is pulled. We might not see the other man get his head blown off, but we can allow our imagination to fill in the blanks. Some of the violence is more graphic. Same scenario, but this time the camera is on the other side of the door where we see the man blown off his feet, from a distance, and we know he's dead. Then there's Ryuhei Kitamura violence. Same scenario, but this time we see the bullet explode into the guys eye, bloody fragments and tendrils all over the place, with this cat collapsing hard on pavement with a pool of blood gathering under his disfigured head. Not a lot left to the imagination there. But it's a movie, right? If I want to imagine stuff I'll read a book. 'Midnight Meat Trains' Ryuhei Kitamura's, 'No One Lives' is a movie that also didn't leave much to the imagination. A film that is pretty basic in presentation that fills in its blanks with lots of style and even more bloody gore. For those of you who like that kind of thing. A girl is running through the woods. I mean she is really booking it. We will learn her name is Emma and the she is some kind of kidnapped heiress and she is played by actress Abelaide Clemens who's some kind of athlete. Put Emma out of your mind right now, but she will return. Say hello to some dude (Luke Evans) who's name we are never given, and his lady love Betty (Laura Ramsey). Amber looks more like Dude's daughter than his love, but there are reasons for that, even though Luke Evans and Laura Ramsey are roughly the same age in real life. Regardless, they are moving from where they were to a new place due to circumstance. These two lovebirds stop off at a diner for a bite to eat, but unfortunately they encounter a crazed group of hillbilly home invaders… actually only one of them is crazed in my man Flynn (Derek Maygar) who does not have nary an ounce left of the good sense God gave him. The leader of this band of thugs, Hoad (Lee Tergerson), seems like an okay guy all things considered, but Flynn will invariably lead these people to ruin. So the Dude and Betty were minding their own business trying to get from point A to point B when Flynn the psycho runs them off the road, and kidnaps them with the plan to torture them into giving the gang whatever they have. This was one of the worst moves in the history of everything because this Dude is bad news. I mean this Dude is the worst news ever. There is nothing positive about this guy… and worse is that this psychopathic unfeeling monster of a human is terminally pissed off at the moment. Hoag and his crew are at their shack of a house, conveniently in the middle of nowhere, and one of the rewards they have from Flynn robbing this Dude is a little package in the car that's potentially worth a lot of money. The Dude wants his package back, and even if he didn't want the package back, he still plans to kill them all. Horribly. Even the people in the house who had nothing to do with anything that was done to him are probably going to die. Because he's the worst dude ever. Ryuhei Kitamura is a master at this kind of thing. I've seen a number of his Japanese films, including 'Sky High' and 'Godzilla Final Wars', and the afore mentioned 'Midnight Meat Train', so this is a film director who has a clear vision and has the talent to let the audience see exactly what he wants them to see. This isn't to say I enjoyed 'No One Lives', because I really didn't, but it is one slick, smooth, expertly executed production. It's not that I wasn't entertained by 'No One Lives' because I guess there is some entertainment value in watching one set of unpleasant people get eviscerated by someone way more unpleasant, and in watching America Olivo take was has to be longest shower in the history of cinema. Had the woman got out that shower after she was clean, and not extended it another fifteen minutes, she might still be alive. Or at least alive a little longer. The bad guy probably killed her because of her gross waste of valuable natural resources. And again, it's not like this movie isn't well done. Every impaling, gutting, gashing, and wood chippering is well staged and crystal clear for all to see. Plus the performances were okay, Luke Evans using his soap opera good looks to maximum effect, Derek Maygar taking crazy way over the top than anyone could imagine, but we particularly liked the odd performance turned in by Abelaide Clemens who scared and tough and clever all at the same time. The thing is… I felt no tension in this film. 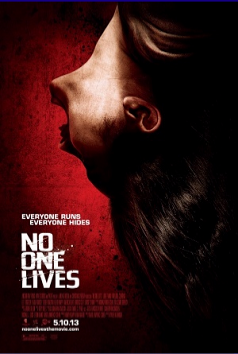 As a horror movie, accepting that I'm probably not going to be all that frightened at this point, I still want to feel uneasy and at no point did I feel that way watching 'No One Lives'. No, I was just kind of benignly watching people get brutally slaughtered with no real feeling or emotion or fear or even concern.  That' brings up another problem, and while I did like the fact that this is a horror movie with no real 'good guy', but this has the side effect of giving us a movie filled with unsavory people, including Emma to an extent, which means we have no real rooting interest in seeing any of them survive. The Dude kind of came off as the hero, in a way, of this piece. And we kind of wanted him dead too. So despite the slickness and presentation of 'No One Lives', with the absence of fear and tension, and the desire to see everybody in it dead… I'm not sure I can call that combination a success.